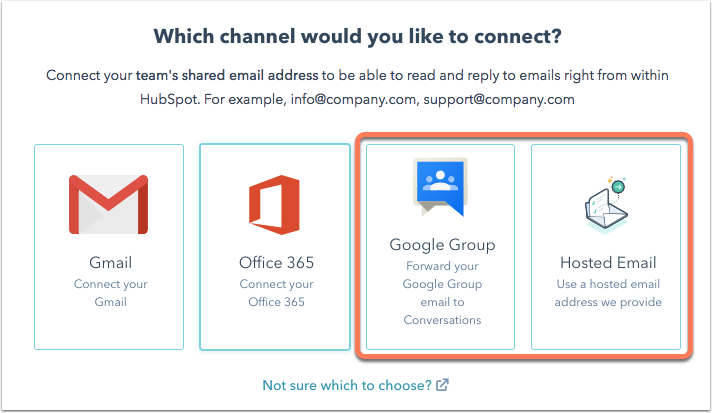 If your inbox is not hosted with Office 365 or Google Apps, you can set up a hosted email in HubSpot, then forward emails from your mail client to your hosted email in the conversations inbox. If you use Google Groups or an email alias to manage your interactions with your customers, you can use a hosted email and still receive and reply to emails within conversations. 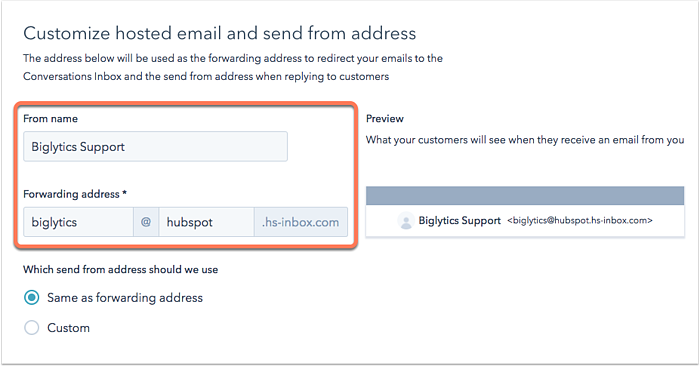 If you are setting up a hosted email address in HubSpot, you will need to add this hosted email address as a forwarding address in your email account settings. If you do not have access to these settings, or are not sure who you are hosting your email with, please reach out to your IT team before following the steps below. In the bottom left corner, click Inbox Settings, then select Email. Select Google Group to forward emails from your Google Group account. Or select Hosted Email to set up a hosted email for another provider. On the next screen, enter a from name and a forwarding address. If you are a paid user, your hosted address will be [your username]@[your subdomain].hs-inbox.com; if you are free user it will be [your username]@[your subdomain].hubspot.inbox.com. Please note: once you configure your hosted email address, it cannot be edited. Set up your send from address. This will be the address visitors see when you reply to their emails in the conversations inbox. Select Same as forwarding address if you want your replies to come from the forwarding address you set up. For example, if you select this option, your replies would come from support@mycompany.hs-inbox.com. Select Custom to send from an email sending domain that you have set up in your domain manager. This is only available for Marketing Hub Professional and Enterprise, and Service Hub Professional and Enterprise. It is recommended to select the same custom sending domain as the email address you are forwarding emails from. If you initially selected Google Group, log into your Google account and add your forwarding address as a member to your Google Group. Follow the steps on the screen to add the forwarding address. Set up your routing rules. When your hosted email is successfully connected, you will see it listed with your other connected channels in the conversations inbox. When you have configured your hosted email and added the email to your mail client's forwarding settings, emails that are sent to your mail client will be forwarded to your conversations inbox. From within conversations, you can reply to any incoming email. However, these email replies will not appear in your email account or in Google Groups. For example, an email is sent to support@mycompany.com. Then, because of the forwarding rules you set up in your email account, this email is automatically forwarded to support@mycompany.hs-inbox.com, which is the hosted email you set up in HubSpot. When you reply to this email in HubSpot, the reply will come from the send from address you configured, but this email will not be in your sent folder in your support@mycompany.com inbox. Any subsequent replies will also only be visible in your conversations inbox, not in your support@mycompany.com inbox.